What is the most effective approach for defending the faith today? What does it mean to do apologetics through the lens of the cross? Sean and Scott interview professor Josh Chatraw about his new book, "Apologetics at the Cross." Josh offers some lessons for evangelism and apologetics today from the early church fathers, and also addresses some of the most pressing questions asked today by both believers and non-believers. 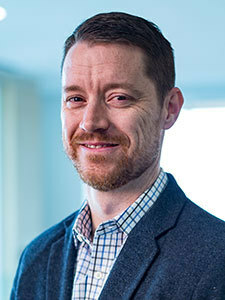 Josh Chatraw serves as executive director of the Center for Apologetics and Cultural Engagement, an associate professor of apologetics and theology at Liberty University School of Divinity, and the executive editor of Faith and the Academy. He writes and lectures in the areas of apologetics and public theology. His recent books include Truth in a Culture of Doubt and Apologetics at the Cross. Chatraw has served in pastoral ministry and is a Fellow with the Center for Pastor Theologians. Sean McDowell: Welcome to the podcast Think Biblically: Conversations on Faith and Culture. I'm your host Sean McDowell, Professor of Apologetics at Talbot School of Theology, Biola University. Scott Rae: I'm your co-host Scott Rae, Professor of Christian Ethics, Dean of Faculty also at Talbot School of Theology, Biola University. Sean McDowell: We're here today with a guest who's a friend of mine, and because of his interest in apologetics, we have just a common passion for the church today. He's written a recent book called "Apologetics at the Cross". My friend Josh Chatraw is the head of Apologetics at Liberty University. You recently wrote a book with an interesting title called "Apologetics at the Cross". You weren't always a fan of apologetics. Can you just tell us your story a little bit of why you came to think this is important for individual Christians and the church especially in our cultural moment today? Josh Chatraw: Yeah. I wasn't always a fan of apologetics, but I was a Christian early on in life. Maybe that was part of it. I grew up in a Christian home, and the Gospel just made sense to me. I went off to college, and when I was at college I played college soccer at a school in Georgia, a state school called Georgia Southern. I got really serious about my faith at the time, but it was the only Christian on the team. You would think maybe that that would be the time where apologetics would've resonated with me, but in fact it didn't. I knew one thing, I knew the Gospel. I was learning how to study the bible, and I would just share the Gospel with my teammates. At least this crew, we weren't the most intellectual crew, so it was like a lot of them weren't interested, but a few guys came to Christ. They respected what I was saying, they respected me as a person, so I didn't necessarily even see the need because of my peer group at the time, even as I was doing ministry. But then towards the end of my time I took a New Testament class at a state school, which can be a dangerous thing to do, and all of a sudden I was just hearing things about the Bible, pretty standard things, I think, in Critical Studies. But it just blew me away, and I began to say, okay, are there answers to these things and how come I've never heard this before. Even though I'd grown up in the church, I was pretty ill equipped to try to deal with this personally. It started off as just a personal need really, actually not with the guys I was ministering to. Then fast forward the story a little bit, I go off to seminary, have a little bit of training in apologetics, but then when I come to the church, I'm just finding this need actually working with college that they're having all these questions. At the same time, I was doing a PhD program, so all of a sudden out of this practical need to try to help people I got into apologetics even though I was on a theological track at the time. Sean McDowell: I think it's interesting that you describe how being in the church is when you started getting questions from college students and apologetics really became important to you. Yet earlier when you were in the church, you never learned apologetics per se. Why do you think that is? Why do you think many churches don't teach it? Is it a lack of understanding, lack of importance? What do you think is at the heart of the issue? Josh Chatraw: I actually think it's probably multiple things going on there. One of the problems we've had in evangelicalism is a certain lack of seriousness sometimes with how we treat discipleship of students, and so there's just a lack of maybe seriousness. I think I see some changes there that I'm encouraged about, but that was, I think, maybe in part my experience just in youth group and things growing up. I also do wonder though sometimes maybe if it's not just the church's fault. Maybe as apologists, we haven't maybe thought about some things going on in the church how we could do this better. And I think that's part of what we were doing with "Apologetics at the Cross". Sometimes apologetics can not feel very pastoral and we don't take our context in mind. I sometimes wonder if while we're lamenting an anti-intellectualism that is there and is real maybe the way this is being presented and even being taught at a graduate and seminary level is in such a way that it actually ... the pastors don't exactly know how to implement this into their church. That was one of really our concerns and passions as we're working on this book project for the last few years. Scott Rae: Josh, it's pretty common, I think, in a lot of our churches to hear people say that, well, people are loved into the kingdom not argued into it. As an apologist, how would you respond to that statement? Josh Chatraw: I would say that we shouldn't have to pick between those. I would want to affirm part of that and say yes, we're called to love. People will know that we are His disciples by how we love one another, and so that is our calling. But I would say we should never pit word against deed or vice versa. Certainly we should love people, but one of the ways we love people is that we're willing to talk to them and help them work through their problems and work through their questions. There's something we can affirm there that's really important and we shouldn't go off on either extreme. Scott Rae: Seems to me that what's at the heart of that is that the recognition in many cases our apologetic is actually designed to win an argument not necessarily win a person. I think that's important to recognize those are two really different things. Sean McDowell: Tell me what you mean by apologetics at the cross, and how is this different from the way apologetics is often done? Josh Chatraw: On one hand, one of the things we were trying to do was when we started looking at actually how people were being trained at an undergraduate and a graduate level there seemed to be this disconnect between maybe the way books were being presented and then ... It was left up to the pastor or the person going into ministry to translate this for their ministry, for how to actually do this in a dialogical way, to do this in a conversational way. This isn't at all anti-intellectual, but it's a matter of integrating disciplines. What we say was we saw a lot of books that really helped us and were really instrumental in our own development, but they tended to be strong philosophically but not historically, or they tended to be strong in one way or the other. What we were looking to do with "Apologetics at the Cross" is really integrate disciplines but then around, and here's the theological part, some of that's the [projical 00:07:50] part, but around what we think is the core biblical motif, which is the Gospel itself. We asked the question, it came up one time in a humorous way. I was teaching a class, and I asked my students why they got into apologetics. One of my students, he was ex-military, he said, "Well, that's easy. I wanna crush the atheists at their own intellectual game." I said, "We are talking about Christian apologetics, right?" I smiled, and he did, too, and he got my point. But that got me thinking what is distinctly Christian about how we're doing apologetics and what if we took the core part of Christianity, the core theological motif, which is the Gospel itself, and then not only our words but our posture and our tone and even how we're going to develop this is actually built around the Gospel. Even thought that wasn't quite what I was saying at the moment, later as I was reflecting on that and reading in some different areas that became a central driving theme of how do we integrate all these different disciplines for the sake of the church in apologetics built around the Gospel. "Apologetics at the Cross", the cross is really we're just using that as a shorthand for the Gospel as we see Paul do in some of his letters. Scott Rae: Josh, I wanted to make reference to a part of one of Paul's letters that I think speaks to the place of apologetics culturally today. In 1 Corinthians 2, the first part of that, Paul's very clear that he does not come to the Corinthians with eloquence or wisdom. He's not this impressive guy. He's not knocking their socks off with this compelling argument, but he comes with humility and the scandalous message of the cross and the power of the Spirit. If that's the case, then why are we doing apologetics in the first place? Because if it's just about the preaching the scandal of the cross and the power of the Spirit, then what use is apologetics within that argument that Paul makes? Josh Chatraw: Yeah. In our book, we talk about how 1 Peter 3:15-16 is the standard apologetic proof text. If there's an anti-apologetic proof text, it's 1 Corinthians 2:1-5. In fact, he says, "I decided to know nothing among you except Jesus Christ, and him crucified", which on one level if you're reading it in just I think on a surface level you could say, well, let's just throw out apologetics and just bring in the Gospel. That's all we need is the Gospel. I think there's several good reasons why most Christians don't read it like that. I think one reason is because if you read the whole letter of 1 Corinthians, he's doing lots of other things other than talking about the Gospel. It seems like Paul is saying something there that's important, but he's not saying don't talk about anything else. I think it's Don Carson, the New Testament scholar, who says that here Paul is in essence saying I'm gonna know nothing else apart from the Gospel. If I'm gonna think about marriage, if I'm gonna talk about family, if I'm gonna talk about life, if I'm gonna talk about work, I'm going to eventually connect it to the Gospel explicitly, and I'm also gonna think ... and I would even suggest even we could go further and say we should think about these things in light of this kind of core Gospel message. I think the context here is important, too. Remembering that Paul's speaking to a particular culture here that so prizes this kind of rhetoric. And it seems what's going on is he's in the situation where they're judging the Gospel message by the type of electricity that he brings with his rhetoric. This is a line ... Paul's very contextual, but he'll also draw a line at times. He seems to be saying, hey, if you're going to use your own games to judge the Gospel, I'm going to highlight the ... and he turns the table on them and says this is this strange thing that ... of a cross, of a crucified Messiah, which is very counter cultural. In some ways it still is. So, he turns the table on them, and he say I'm not gonna play your games because you're judging me by these cultural standards. Paul will contextualize, but he will draw the line at certain times. Scott Rae: I think if you read a little further in that passage, too, Paul will point out that the Corinthians themselves weren't particularly impressive either, so the demand for this rhetorical flourish in their Gospel presentation was a bit hypocritical. Let me followup one other thing on that. Of course apologetics has value because of the passage 1 Peter 3 that you mentioned. I like to put it that it's really tough. It is true that people are not argued into the kingdom, they are loved into the kingdom. But the heart generally doesn't rejoice in what the mind also rejects, so there's a real place, I think, for apologetics to set up what sociologists call a plausibility structure for faith. That makes a big difference. But the Bible's also really clear that we proclaim the Gospel, we don't bring people to Christ. We proclaim the Gospel, we invite people to believe, but changing people's hearts is ultimately God's responsibility through the work of the Spirit. How does apologetics fit into that overall, I think, umbrella that it's the Spirit's work that ultimately brings people to faith? Josh Chatraw: It's obviously the Holy Spirit works through his word and through his people. We are the body of Christ and the Spirit is working in our lives and in our lives as a community. As we're presenting the Gospel, we're praying the Holy Spirit will work. And as we're sharing the Gospel and as we're taking on challenges to the Gospel and we're explaining the Gospel and we're using apologetics, I think it should be bathed in prayer. It's not a secular task. Charles Taylor in his work "A Secular Age", which is really philosophically and sociologically on the backdrop of a lot of our book here with "Apologetics at the Cross", one of the things he observes about something that happened in the 17th and 18th century is apologetics became this kind of ... He talks about how a lot of the elements of prayer and devotion and Christology were lopped off of apologetics, and it seemed more of arguing for deism. He says this was a big problem with how people actually took up the task of apologetics. They seeded the game, so to speak, and it became over-rational without this kind of deep devotion tied in with it. And I agree with Taylor. I'm not saying that's where we're at. I think sometimes today apologists are sometimes given a poor rap today on this one because I never have actually heard and apologist play off the Holy Spirit from arguments. They tend to want to emphasize when they're talking to Christians the importance of the Holy Spirit, and that's from apologists from a variety of traditions. So, I think sometimes maybe unfortunately there's a certain caricature against apologists. And maybe we need to emphasize that some more, but I've never actually heard any apologist make that theological mistake. Sean McDowell: Hey Josh, sometimes people say that apologetics is not important for the church. I think Jesus did a kind of apologetics, Paul did, and interestingly enough some of the first Christian fathers are actually called apologists. You have a section in the book where you go back and look at them, and I'm curious. What are some of the issues that they were facing, and are there direct implications for where we're at culturally and maybe some lessons we can take from them for today? Josh Chatraw: Yeah. Some of the works that helped us on here are obviously because we are integrating a lot in the book. If I can give book plugs on the podcast here, Larry Hurtado's book "Against the gods" was helpful here as well as some other books. One of the points we saw as we were working through this, one, this is a pluralistic society. It was obvious to them that they were the minority, and people felt that they were strange and against the larger society. These are all things that I think we're feeling right now in the west. Not the minority that the very early church was, but I think we're starting to feel like ... for a lot of people when I talk to them they are starting to feel like strangers in their own country, especially an older generation. I do think there's one big difference that we have to take note of here. One of the big differences is even though people felt their morals were strange and that they were this strange group, they had never held power. Although we're seen today as strange and at times against the larger society, we're perceived, and this is of course right, Christians held power in our country, and we feel like that's starting to slip from our fingers, but we're perceived as having held power and abused power. They were new and looked at with suspicion like we are today, but I think that there's probably some actual reasons today to look at us with suspicion. In some ways there's this connection there, but then there's this challenge, there's this context. Whether our listeners think that's fair or not, we're perceived as being people who have been coercive and abusive when we held power. That's a context we need to take note of and we need to realize as we're engaging with people. Sean McDowell: That's a great and important difference to bring in. Speaking of power and authority, this is a personal tactical question I have for you. I find myself when I'm being asked tough questions about, say, the morality of Hell or genocide in the Old Testament or Jesus being the only way, some of the big questions I get, the older I get I find myself saying, you know what, if Jesus is really God and He saw with more clarity on this and spoke on it, isn't His word enough? That's increasingly okay for me, but I wonder your thoughts on that approach because it kind of is an appeal to authority. We live in such an individualistic anti-authoritarian culture. What are your thoughts on that with either believers or non-believers that raise those kinds of tough moral questions? Josh Chatraw: Well, yes. First thing, one of the points we're emphasizing in our book and when I teach and I think you both will resonate with this is that apologetics is ... it needs to be contextual and personal and to a certain person. You can't always do this. You're speaking at an event, you're preaching or something like that, but we have to take who we're talking to into account here. I think totally in situations for me at times I'll say, "Hang on, you don't like this idea of Hell. Are you saying that Jesus didn't rose from the dead because you don't like Hell?" And I think at that point, in a nice way, maybe nicer than I just came across, I think they'll say, "Well, no, of course that's not what I'm saying." And then you're able to say, "Well, let's talk about the resurrection of Jesus. If he is Lord, then we should listen to him." On the other hand, let me jump in here real quick, let me give the other part of this. I think we need to be careful when we do that that we don't get it in our mind that we can separate the beauty and goodness of Christianity from the truth of Christianity. In other words, we can just say just think logically about this, don't worry about if Christianity is actually good. We might be able to for a little bit try to have that conversation about the resurrection. I think that can be effective, but I think eventually we will need to come back around to saying, hey, there's actually something about God's, in this particular example, judgment or justice that actually makes some emotional, experiential, and rational sense. I think thinking strategically, you gotta think who am I talking to, where is this person at, and it might be that you sidestep that for a minute. But I think oftentimes we've gotta realize we're gonna probably come back and try to talk about whatever that particular issue is some more to help them think through it more deeply. Scott Rae: Josh, I think it's pretty commonly said, I've heard it quite a bit, that a generation ago when I came to faith as a teenager, a fundamental question we were asking was is Christianity true, and apologetics was really important. My understanding today with gen Z and millennials is the question they're asking may be a little different. They're asking what you had mentioned here, is Christianity good is more the fundamental question that they're asking today. Your thoughts on that. Josh Chatraw: Well, I agree. What it means is ... Sometimes when I talk to some of my colleagues it's like but my job is to talk about the rationality of Christianity. And I appreciate that, but if this is the problem people have with Christianity and it might not fit in certain traditional categories of the problems that you like to deal with, I don't know what to say to you other than this is a key issue. We have to, I feel, if we're gonna do this for the church, if apologetics is for the sake of the Gospel, then we need to figure out what people are struggling with and deal with that. I think certainly the question of its goodness is something that we have to address, and this is really where "Apologetics at the Cross" is really saying, hey, one of the things we have to do is we have to figure out why people have certain visions of the good life like they have. Normally, people have visions of the good life or visions about what's good because they've, you mentioned the word earlier Scott, they've adopted certain plausibility structures, or what Charles Taylor calls they have a certain social imaginary that comes to them almost spontaneously. They haven't reasoned their way to that, but they've more inherited that. To deal with this question of the good life, we've gotta actually teach people and learn how to step into their social imaginary and show them, hey, there's something maybe here that's right that I can affirm, but this doesn't actually make sense. You have this desire for justice, just as an example. Well, that's good and right, and that's something as Christians we should affirm and say yes, God is a God of justice. We're with you on that. But does that make sense with these other things you're saying? Does that make sense within this framework, these other things you're affirming? A lot of times they haven't worked that out, so we have to come alongside people and help them articulate what they haven't even articulated for themselves because they just inherited it. What we're trying to do here is give people a vision for apologetics that comes alongside of people. And there is an argument and there is ... You're using reason and argument, but you're coming alongside people to try to help them even at times articulate their own position because they can't get there. They don't even know why they hold to this. It just makes sense to them. Sean McDowell: Josh, thanks so much for coming on. 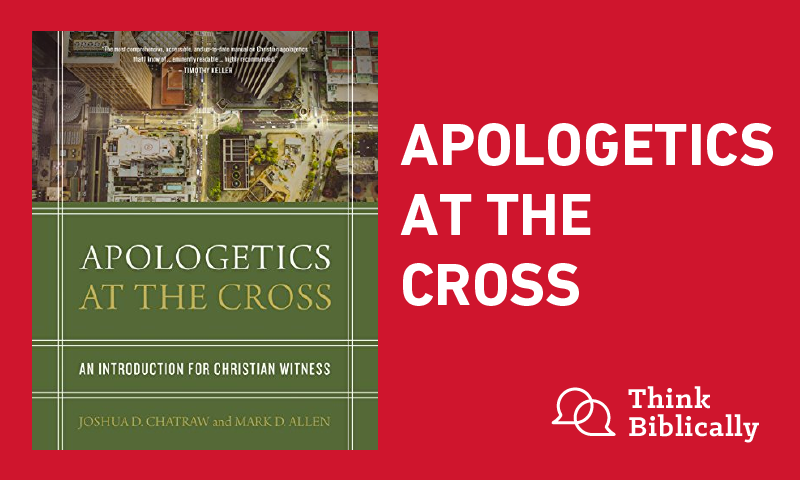 I have many more questions that I'd love to ask you, but I think this will be a good excuses for me to suggest that our listeners go get a copy of your excellent new book, "Apologetics at the Cross". Most importantly, thanks for your work just being an apologist who speaks truth but does it through the lens of the cross and out of the spirit of love and generosity towards people. That's what we're aiming for at Biola University. Josh Chatraw: See you guys. Thank you. Sean McDowell: This has been an episode podcast Think Biblically: Conversations on Faith and Culture. To learn more about us and today's guest, Josh Chatraw, and to find more episodes, go to biola.edu/thinkbiblically. That's biola.edu/thinkbiblically. If you enjoyed today's conversation, give us a rating on your podcast app and share it with a friend. Thank for listening and remember think biblically about everything.